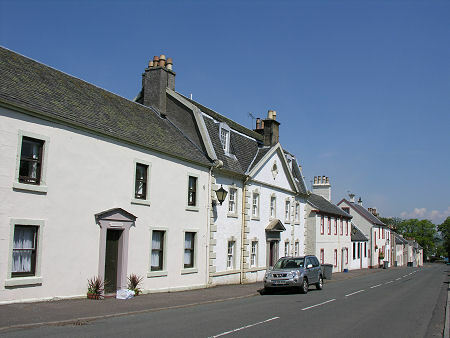 Eaglesham is an attractive dormitory village in East Renfrewshire standing some eight miles south of the centre of Glasgow and four miles south west of East Kilbride. It is best known for being built on a hillside site either side of a long triangular village green which gives the old heart of the village a great deal of character. 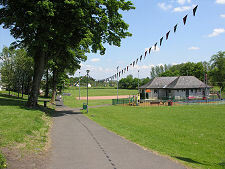 In many ways Eaglesham can be viewed as the southern edge of Glasgow's catchment area. 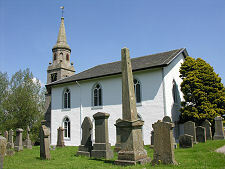 It stands on the northern side of the East Renfrewshire Hills, which continue to climb to the south where they form Eaglesham Moor and the Whitelee Forest. In May 2009 Whitelee Wind Farm to the south of the village became Europe's largest onshore wind farm, with 140 wind turbines and the capacity to generate over 300MW of power. Another fairly recent development was the building of the A726 dual carriageway to the north of Eaglesham. Combined with the new M77 this provides a bypass for traffic between East Kilbride and Ayrshire, which had previously all travelled through the village before heading over Eaglesham Moor. Eaglesham seems to have ancient origins. 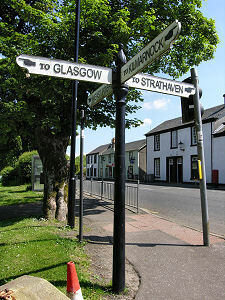 It has been suggested that the road running from south west to north east through the village via Eaglesham Moor follows a line originally developed by the Romans, given that its very straight path seems to point directly at the Roman fort at Bothwellhaugh. 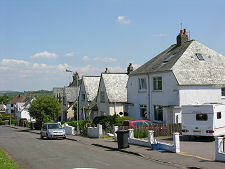 The name of the village comes from egwys ham, meaning "the village by the church" in the Brythonic language of the Dark Age kingdom of Alt Clut or Strathclyde, which included this area in the 600s and 700s. It therefore seems reasonable to assume that it served as a very early Christian centre. 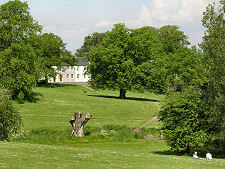 By the 1300s the area was owned by the Montgomerie family who lived at Eaglesham Castle. Sources differ as to whether this stood in the village or at Castlehill, a mile to the north west. At the Battle of Otterburn in 1388 Sir John Montgomerie of Eaglesham captured Henry Percy, 1st Earl of Northumberland. The ransom paid for Percy's release funded the building of Polnoon Castle, a miles south east of Eaglesham, into which the family moved from Eaglesham Castle. The Montgomeries abandoned Polnoon Castle in favour of Eglinton Castle in Ayrshire in the 1600s and very little sign of it now remains. 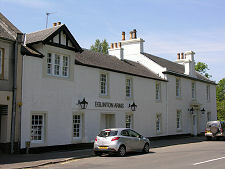 In the late 1760s Alexander Montgomerie, 10th Earl of Eglinton, decided to redevelop the dispersed collection of crofts and farms which formed Eaglesham into something more orderly. From 1769 the result was the growth of a new planned village, whose most distinctive feature was the long central green which does so much to help define the character of the village today. This was flanked by long rows of houses which climbed steeply up the hillside to Eaglesham Moor. Before long the Montgomeries had built a cotton mill on the green powered by the water of the burn, and another followed before the end of the 1700s. The last of the cotton mills was destroyed by fire in 1876: traces of it can still be seen on the green (or, as it is known locally, "the Orry"). 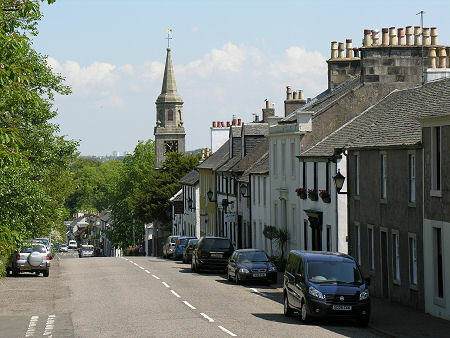 Eaglesham had a moment of fame during WWII when Rudolf Hess, Hitler's deputy, landed nearby by parachute before being imprisoned. 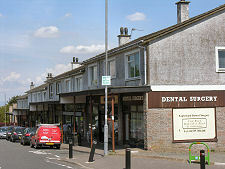 Eaglesham had declined sharply by the end of the 1950s. 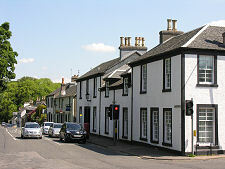 In the 1960s plans to demolish many of the village's historic buildings were opposed by a group of local residents, who succeeded in having Eaglesham declared Scotland's first Conservation Village. 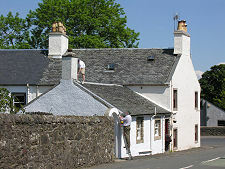 The result has been the preservation of the essential character of Eaglesham, which has survived despite more recent residential development around the edges of the village.